Miniature Worlds get the Best Dollhouse Now! Break out into your Miniature Worlds! Miniature Worlds in 1/12 Scale are for people who want to build dollhouses but not on a grand scale. Think building a tiny structure is too complicated? Why not start with this book that we are reviewing? Miniature Worlds in 1/12 Scale by Susan and Martin Penny. Next they move on to the Projects themselves. They list a creative mix of seven in total. Following all of this information as well is a section for any template needed to complete the projects. Plus a detailed index at the very end. That's right these authors teach you how to weave your everyday containers into awesome works of art. Where a walk around your local supermarket becomes a creative journey and an awe inspiring adventure. With them you can begin to imagine boring packaging as a new idea to incorporate into your latest tiny scene. They teach you that even something you today consider garbage could be the best addition for your current project. So today as a lot of us are already recycling this is a great volume to have on hand. Yes putting material to use in a creative way makes all the more sense in our world where there really is too much garbage. Having items come out as works of art is the best possible conclusion. By taking part in the look inside feature you get to view your book before buying it. So you can essentially get the feel of whether this volume is of interest to you or not. Click on the above book link to go there now. This action shows you the contents of the book clearly outlined. A sampling of the first few pages are detailed as well. Plus viewing the art work included lets you know the quality they planned as they worked each project. 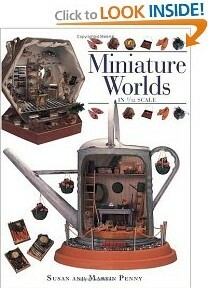 Do the authors and you have a common interest in what is presented inside Miniature Worlds? The "Surprise Me" section has a good detail of the creative process needed for making a step ladder that does not look complicated. The descriptions going into this project are endearing. The authors of Miniature Worlds paint you a colorful picture of creating these mini scenes. You will almost feel as if you are traveling along with them. Digging into the meat of your creation is easy. You can successfully scan through the book and if you see a particular project that will fit perfectly in your current project... Why not go for it? But truthfully we think that as you scan through this book you will be sufficiently enticed to proceed with one, if not all, of the projects outlined. Gathering up your supplies as they inspire you to. As you purchase and enjoy your new Mini Worlds project book keep in mind this reviewer's words... And expectantly await the arrival of this volume! Miniature Worlds Delivers In A Big Way! "Susan & Martin Penny have written a fun book that is chuck full of projects for do-it-yourselfers. They show how to create tiny items from inexpensive materials (craft sticks, aida cloth, beads, pins, paper, clay, etc. ), and/or things you might normally throw away (bottle caps, coffee stirrers, aluminum foil pie plates, etc). 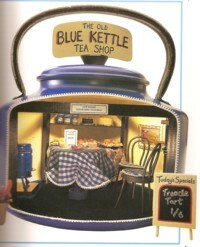 There is a wide range of projects, including a tea room inside an old teapot, a ladies hat & accessories store inside a hatbox, a whimsical fairy dwelling (made with twigs, dried cones, and other interesting things you may find in your backyard or the woods). There is also a wizard's room depicting an open book, which serves as the walls of the castle where the wizard lives. This is a book that will pay for itself in no time at all with the money you save by making your own accessories. It's a must for the DIY-er and I highly recommend it!" Enthusiastic Quote from Amazon. Don't forget to investigate the last several month E-Zine Issues that look into different topics related to miniature worlds creation. Check those issues out here. We are using a technique such as the above book would use. Using things from around your home. Cut the back and sides from the heavy card in one piece. Score and bend. Cut the shelf baffle, drawer and cupboard pieces from the heavy card. Score and bend. Glue the bottom shelf in place. Glue the shaped baffle below the bottom shelf at the front. Fix the upright cupboard in the centre of the frame, and glue it to the bottom shelf. Glue the semicircular shelves either side of this cupboard. Bend the main sides of the tallboy around and glue the drawer unit in place, resting on the upright cupboard. Cut false drawer panels from the light card and stick these to the front of drawer unit. Glue the bracelet links to the centre of these panels. Use the eyes from the fasteners in the centre of the bracelet links to form drawer pulls. Trim with a thin strip of light card across the top and the bottom of this drawer unit. Cut separate strips for the front and sides, or wrap a continuous length around. Glue a jewelry piece over the hole in the centre back of the sideboard. Stick the top shelf in place. Top the whole tallboy with the brooch. Decorate the front of the upright cupboard with the drop earring and curtain hooks. Fix the brass tack in place on the cupboard front as a handle. This technique illustrated will help you do your own thing at every turn while constructing your furnishing if you so desire. However the pattern was not our creation. It was taken from the book, Making Victorian Dolls' House Furniture by Patricia King. All the creative details can be found on pages 54 and 55 of Patricia's book. Want more about this volume? Inquire by the above link. All the best to you in your on-going miniature worlds progress. As we happen to own a copy of this book and enjoy the information provided we highly recommend it. View or Buy Mini Dollshouse here. Getting creative with miniatures has never been easier. Online there are so many interesting, creative miniatures to choose from. People who make these do a wonderful job. They have so much talent in this area. How do people work in such a tiny area? Plus make it all look so real? We know these crafters must possess a huge amount of patience to handle items in such tiny proportions. The above block of miniatures do not solely have to do with kitchen decor only. It is simply pictured here to begin you thinking of any area in your tiny mansion you desire miniatures for. At the end of this section you will find a link to take you to more items for you miniature worlds. Get all your reading supplies. 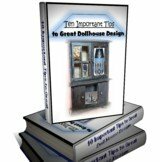 10 Important Tips to Great Doll House Design! 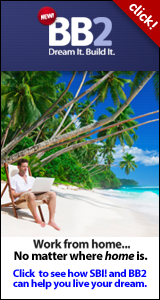 Get our new free ebook today. Learn how to start your next project with the enthusiasm it and you deserve. Castle Dollshouse. Royal Knight's storybook adventure in the making. Build a Castle that makes people instantly desire it. Looking for information on ideas concerning this style of dollshouse? Check out this page and see how to start this new project today. Log Dollshouse. The best home away from home there is. Log or Cabin Style. When you can not get away when and how you long to. Get the next best thing by building one of these structures. Set your mind into the distant place you create and enjoy every minute. Have the tiny Porcelain Dolls that you Really Want! The fun of small porcelain dolls. This display will inspire you from bygone days for your miniature worlds! To see more issues of our Newsletter online click here.